Williams driver Pastor Maldonado has admitted he needs to change his driving style and curb his aggression. The Venezuelan has had seven penalties for driving infringements in 12 races and has not scored points since winning the Spanish Grand Prix in May. "I have been penalised quite a lot," he said ahead of Sunday's Italian Grand Prix. "We need to try to do something different to be away from the stewards. "This is not the first time a driver is living in a bad moment." He added: "We need to look around, start again, do some good races." Maldonado, 27, will be given a 10-place grid penalty at this weekend's Italian Grand Prix for two separate penalties in Belgium last weekend. He was given one five-place grid penalty for jumping the start and another for running into the back of Timo Glock's Marussia. In Belgium he had already been given a three-place grid penalty for that race for impeding Force India's Nico Hulkenberg in qualifying. 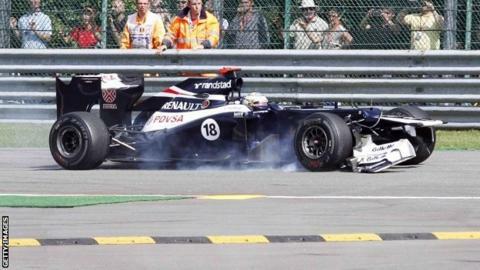 Maldonado said in Monza on Thursday: "To criticise is always easy, especially when you are outside the track. I need to evaluate what happened, what I can do to not make the same mistakes in the future. "I think the mistakes are always different. I need to get out of this moment and that's it. When I am on the track I think I must evaluate the situations. "It is difficult to say now this style or I will change that. I need to evaluate more the situation in the car." Asked if he would find this difficult, he said: "It's not difficult. It's more difficult to push and to try to be aggressive. "At the moment we are all worried and all talking because I was involved in so many penalties this year but the only thing is to be away from the penalties, try to race, try to recover some points. "I feel confident with myself and the team so we will see now if we can come off for this moment."